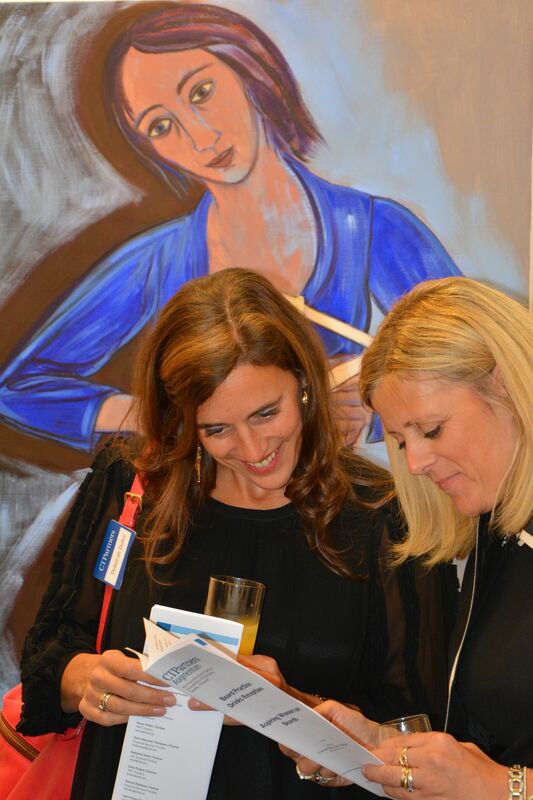 On Wednesday evening the What I See team were delighted to skip over to Soho to attend the Aspiring Women on Board reception, hosted by CTPartners Augmentum at the the Art First gallery. In the very same space that played host to our filming days, the team got to sample a few too many canapés (mini beef burgers with horseradish, anyone?) and admire the work of our ambassador Eileen Cooper, whose exhibition Edge to Edge is on at Art First now. 100 senior female executives and NEDs (that’s Non-Executive Directors, to you and me) from leading companies were present, and we all crowded together to enjoy the speeches. We were particularly interested to hear Eileen’s work described as “contemporary” and “expressive”… very true attributes that also make her a perfect What I See ambassador. Afterwards, we exhibited Eileen’s feature video – it was great to be able to show her paint the very works that surrounded us. Feeling envious? Don’t worry, you can see it for yourself here.